According to Scientist David Bloom, flex fuel is better for the environment than traditional gasoline and is also cost efficient. Currently the price of alcohol is 90 cents less then gasoline. 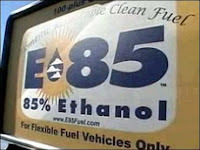 And as the popularity rises for flex fuel, there are Apple and Android apps for consumers to locate the nearest station. There are currently less than 2,000 flex fuel stations nationwide. Automakers including General Motors, Ford Motor Company and Chrysler have committed to 50 percent flex fuel cars within the next couple of years. But according to industry insiders, there are 10 million flex fuel cars on the road and many drivers are unaware they are already in one. When the Open Fuel Standard Act has passed, it will become commonplace for cars to be flex fuel, and fuel stations with choices will be ubiquitous. And because of the bigger market and greater amount of competition, fuel prices will be even lower than they are now. Let's make this happen quickly. Start here to find out what you can do.